Our company has just recently started using MS Project Professional 2010 and we plan to eventually have a Project Server installation. I've created a few projects so far, but still claim to be a complete novice. A customer has just requested a quote for some work, so I've created a project plan for the proposed work, however I'd like MS Project to tell me how much working time I've allocated in the plan I've created. The only information MS Project seems to offer is the difference between the start and end date of the project (9.38 days), but what I want is the time my staff will be working on the project, which shouldn't include lag time or times outside the calendar that I've created. I've calculated this as being 36 hours from the non-summary tasks in the example below (apologies for having to blur the task names). Whilst this example is only tiny, I want to know how to get MS Project to calculate this for me in future on much bigger projects. Can anyone point me in the right direction or tell me what I'm doing wrong? Update: I've found that if I allocate a new 'test' staff resource rate of £1/hour for simplicity, I can see a cost of £36, which matches the 36h I'm expecting to see. Go to the "Resource Usage" view. Go you get there differs slightly depending on which version of Project you are using, but look for a Views menu or on Project 2010, look at the leftmost button on the Task tab (by default) for your Views selection. This will give you the actual time allocated for each resource in the plan broken down by task and totalled at a resource level. Show the "Work" column in the Gantt Chart (right-click the column headings on the left side of the Gantt Chart, select "Insert Colum", add 'Work'). This will show you the actual amount of work specified for each task irrespective of the type and nature of the resources assigned to that task. Which method you use depends on what you are comfortable with and what kind of breakdown you want to get out of it. Turn on the display of the Project Summary task (Gantt Chart Tools Format ribbon). 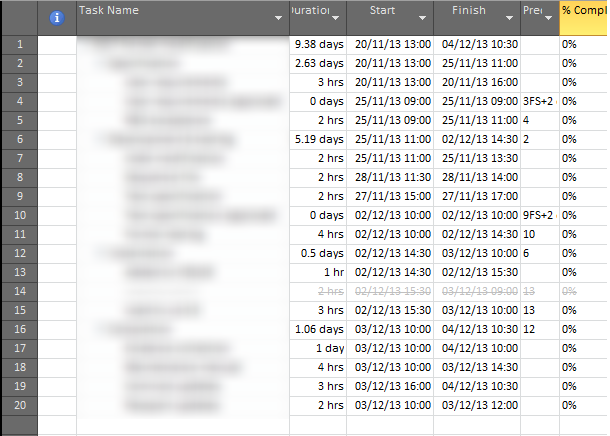 Add the work column and that will display the sum of the assigned work for all tasks in the project. Not the answer you're looking for? Browse other questions tagged ms-project estimation ms-project-2010 or ask your own question.